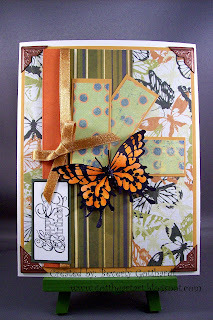 It's not hard to make a wonderful card when you go through your stash and come up with pretty papers, ribbon, and tiny rhinestones, that coordinate and a smashing stamp to finish it off with. Supplies: Cream Card Blank 5" X 6 1/2" Halcraft, Papers: DCWV-Safari Chic Stack, Fancy Pants Designs, We Are Memory Keepers, Stampin Up-Very Vanilla, Stamps: Studio G, Ink: Ranger Archival Ink-Jet Black, Copic markers, Daisy D's-photo corners, Recollections-Rhinestone stickers, ribbon-Michael's, glue dots, pop dots. That's such a pretty card!